​View of Colter's Hell & DeMaris Hot Springs, smell of sulfur (detraction? 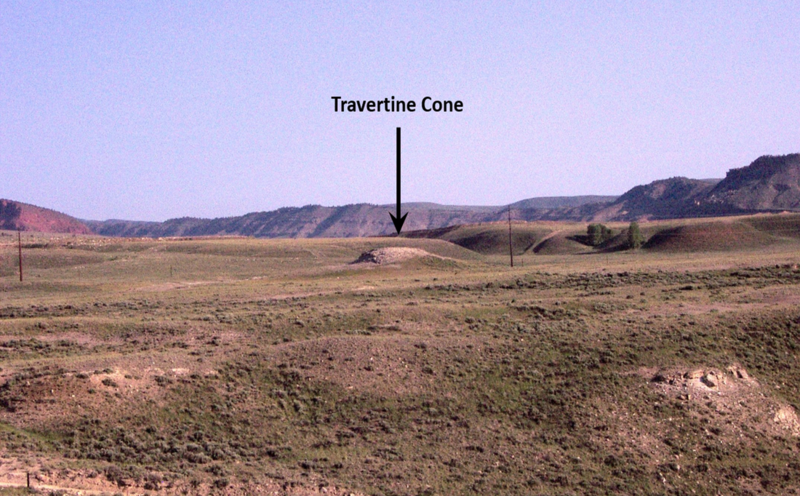 ), travertine cone & outcrops, craters, nice view of Cody area from part-way up Cedar Mountain. But Colter’s story was true. 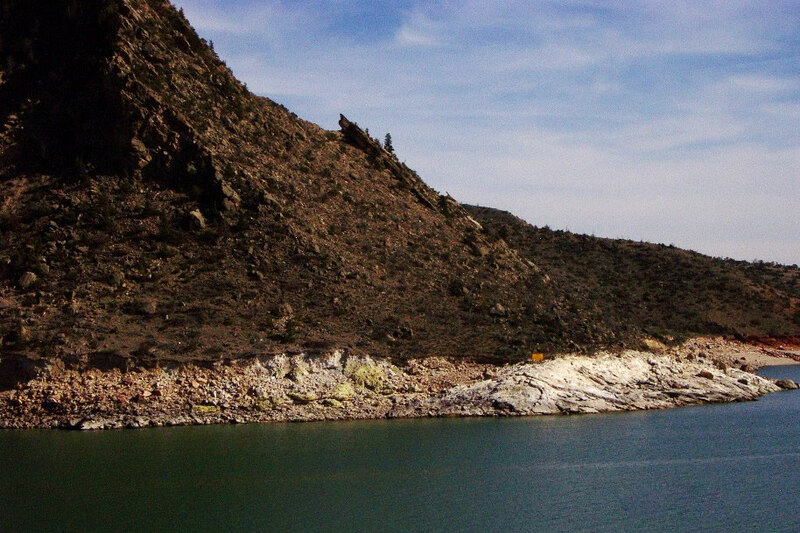 The features he described are the surface expression of the Cody hydrothermal system. The thermal features have nothing to do with Yellowstone or the nearby Absaroka volcanic activity which ended over 45 million years ago. Rather it is groundwater being heated by the earth’s geothermal gradient as it circulates eastward from a basin beneath the Absaroka Mountains to rise along the outcrops at Rattlesnake anticline. Geothermal gradient is the rate of temperature increase as depth increases. 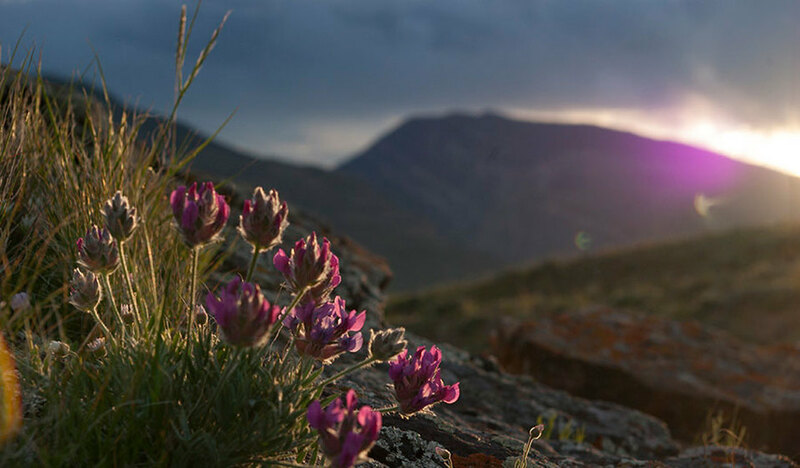 The Bighorn basin average geothermal gradient is 16 degrees Fahrenheit per thousand feet. Aerial mage of surface expression of the Cody hydrothermal system showing travertine deposits (blue), sulphur deposits (yellow), hot springs: 1. DeMaris, 2. Shoshone, 3. Needles, and 4. Colter’s “boiling tar spring” and original stream courses before reservoir flooding (dark blue dashed line). 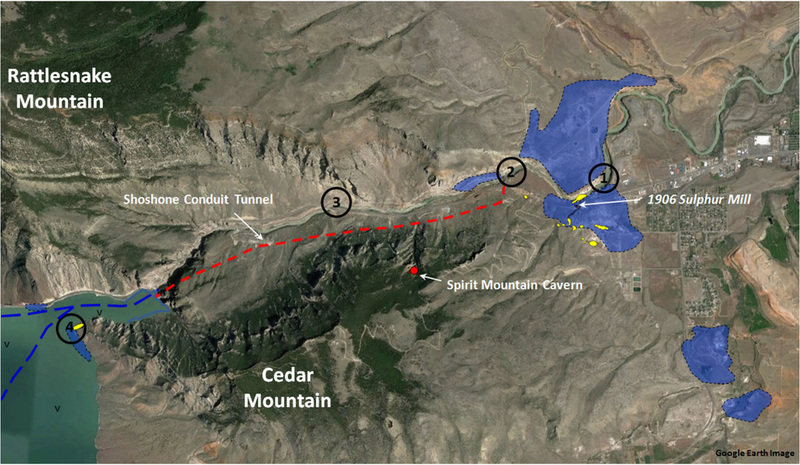 Spirit Mountain Cavern (red dot), discovered in 1909, is probably part of a larger cave system discovered by Bureau of Reclamation miners while constructing the Shoshone conduit tunnel (red dashed line) in 1937. The system appears to be connected to the Needles hot spring. Sulphur deposits were mined during World War I. Image from: Base: Google Earth Image; Overlay Data from Heasler, H.P., 1982, WGA Guidebook, Fig. 6, p. 172; Love, J.D. and Good, J.M., 1970, USGS PP 644-B, Fig. 15, p. B20; Woodruff, E.G., 1907, USGS Bulletin 340, Plate VI, p. 452. Travertine ledges occur at different levels in the canyon. The area just north of Colter’s Hell is a broad terrace that exhibits several hydrothermal features. 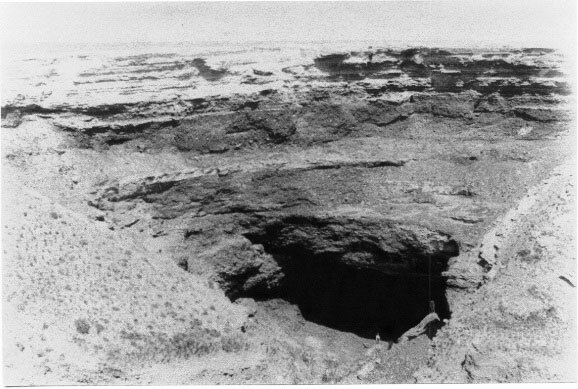 The most dramatic feature is a large 40 foot deep sinkhole that marks the position of a former hot pool. Travertine is deposited from hot springs that have hot water circulation through carbonate rocks. 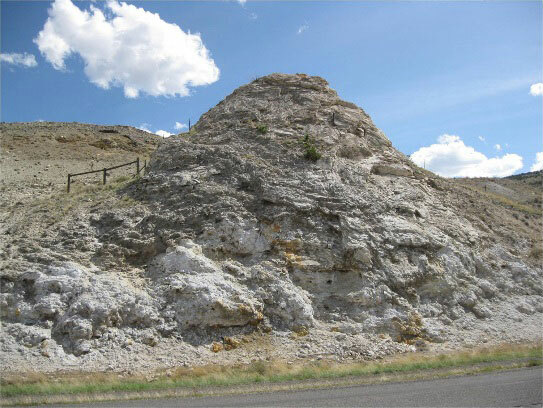 The Cody Hydrothermal system is sourced through several such aquifers in the Phosphoria, Amsden, Madison, Bighorn formations and the Pilgrim limestone. The bubbling water in hot springs releases carbon dioxide at the surface that allows a chemical reaction where free carbon ions (Ca2+) join with carbonate ions (CO32-) to precipitate calcium carbonate (CaCO3, calcite or travertine). Small travertine cone near Colter’s Hell on north side of road. 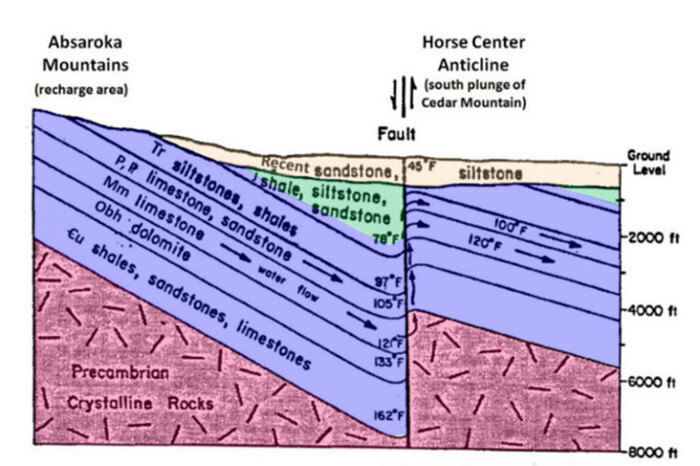 Subsurface well data indicates that the Cody hydrothermal system extends at least seven miles south of the canyon (Horse Center anticline). 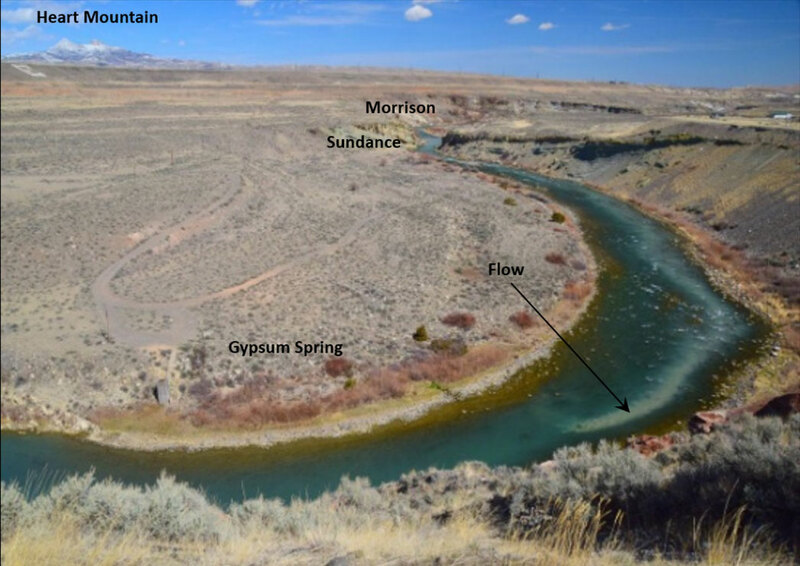 A recent (March 25, 2016) short-lived hydrothermal feature appeared at a bend in the Shoshone River near the contact between the Gypsum Spring and Sundance formations. 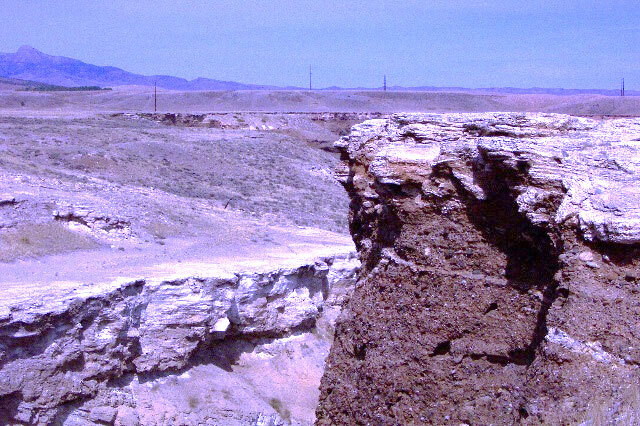 There are no known faults in the area but fractures exist that may account for the flow. (There were two recent earthquakes west of Pollux and Caster Peaks near the confluence of the Lamar and Little Lamar Rivers about 47 miles west of Cody: Mar. 17 & 22, 2016 both with magnitude 1.9 at 42,650 foot depth). Short-lived hydrothermal flow plume in the Shoshone River in 2016. 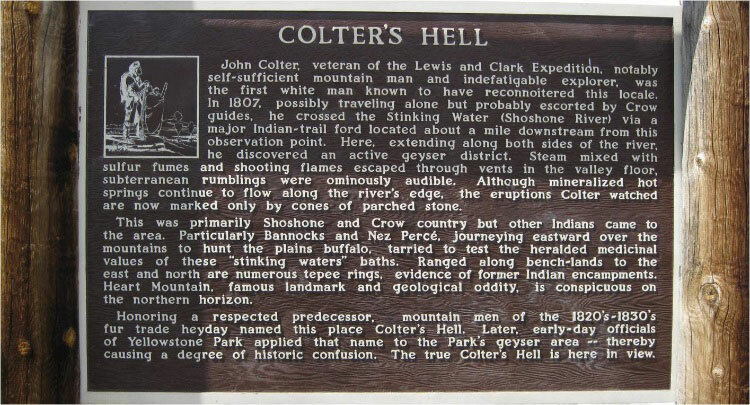 ​Stand to the left of the Colter’s Hell interpretive sign at the Demaris hot springs pull-off and look across the river. On the left you will see orange and yellow colored Pennsylvanian Tensleep Sandstone that has been altered by the geothermal fluids that passed through the rock. 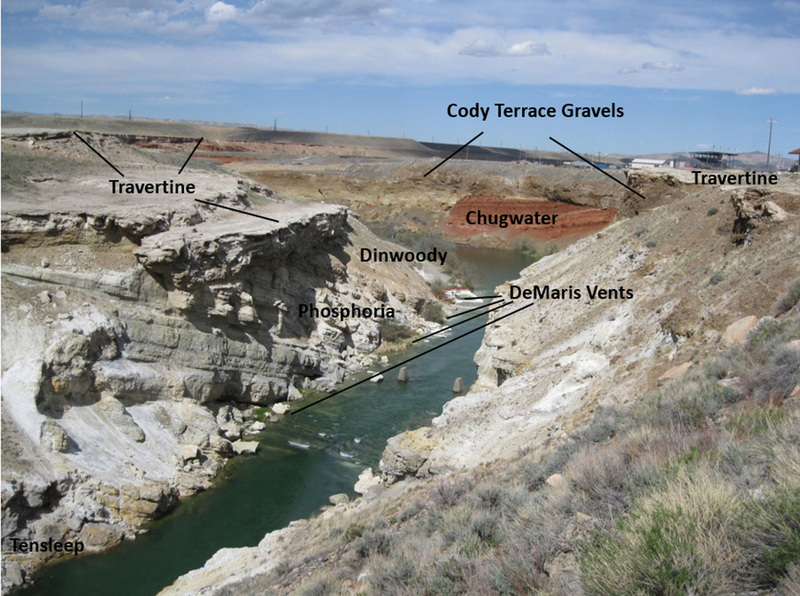 On the right near the pylons in the river are outcrops of the Permian Phosphoria Formation dipping east into the basin. The Phosphoria and Tensleep are two of the most prolific oil producing layers in the basin. The flat lying beds at the top of the cliff are travertine limestones that were deposited by the hot springs. To the far right next to the river is the Demaris hot springs where the hot water is now contained in an open swimming pool (private). The spring is named after Charles Demaris who homesteaded a 160 acre parcel around the spring in 1888 for its healing powers. This occurred prior to the founding of Cody. Demaris ran a bath and bottled the water for medicinal value. In 1902 he built a large two-story hotel/resort near the springs along the road to Yellowstone on the north side of the river. In 1923, a new building enclosed the spring, but the roof was later removed to let out the strong sulfur odor. Although the building was destroyed by a flood in 1981, the public continued to access the pool/spring via a rickety old bridge. Eventually the bridge was removed and access closed by the owner. ​Starting at the intersection of US 14-16-20 (Sheridan Ave) and US 14A (16th St) in downtown Cody, head west toward Yellowstone on US 14-16-20. Travel through town, 0.8 miles Buffalo Bill Center of the West, 2.8 miles Old Trail Town, 3.2 miles Rodeo Grounds – Stampede Park, 3.3 miles on right is defunct Cody health spa that had a thermal indoor pool sourced from a 134 foot well that supplied 99 degree F mineral water at 209 gallons per minute. At 3.5 miles large travertine cone on left (see picture above), 3.6 miles pull-off to right for view of Demaris hot spring and Phosphoria outcrop, 4.0 miles turn left for optional rough road part-way up Cedar Mountain.